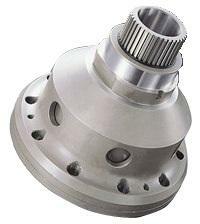 Cusco Tarmac Gears allow you to split the torque distribution of your AWD to a preset Front/Rear ratio. With the ability to divide power up to 35% to the front and 65% to the rear, you can drive your AWD vehicle like RWD! You can drift like RWD, but still with the fine acceleration of the AWD. You can do the Side-turn, with the parking brake, as it does not have the Center LSD function.